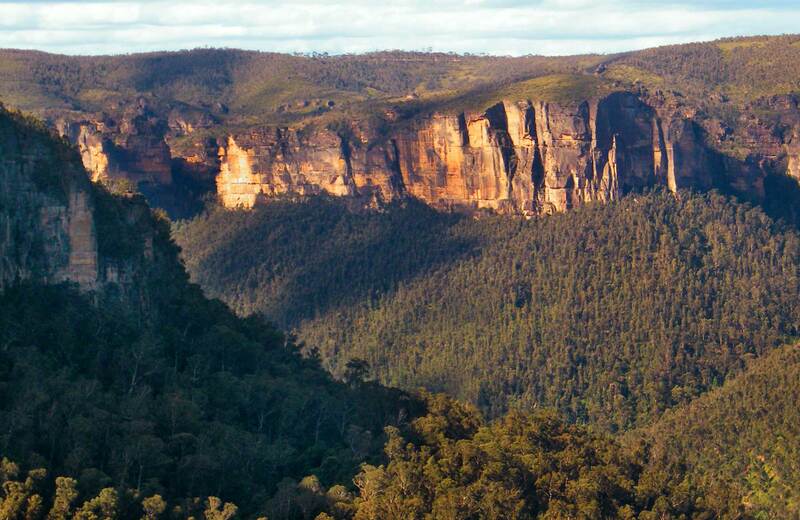 The Greater Blue Mountains World Heritage Area is a million hectares of national park and wilderness dominated by temperate eucalypt forest. The area supports exceptional biodiversity including a number of rare plants. It is also highly valued for its Aboriginal heritage and its outstanding geological features, such as 300m sandstone cliffs, slot canyons and waterfalls. Within easy reach of Sydney, visitors can take in the scenic views from lookouts or explore the wilderness via walking tracks or cycling trails. Greater Blue Mountains is a World Heritage-listed area of diverse landscapes filled with plants, wildlife, caves and rock formations in NSW national parks. It's full of cultural significance, with six Aboriginal groups having connection to the Country of the Area, as it's tied with Dreaming and rock art. Take a day trip to famous Echo Point lookout in Katoomba for stunning views of the Jamison Valley and the iconic Three Sisters, in the Blue Mountains. You can see for miles at Kanangra-Boyd lookout, an easily accessible viewpoint overlooking Kanangra Walls and Mount Cloudmaker.